Many individuals confuse sleepiness and fatigue when in fact they are very distinct phenomena that can be carefully dissected. They often come together but not always. There are standardized questionnaires that can evaluate sleepiness and fatigue but unfortunately at this point in time there are only objective tests for measuring sleepiness but none for measuring fatigue. For many patients with sleep related disorders, their real concern is their daytime functioning and whether they are sleepy or fatigued. This has many ramifications in terms of work productivity, enjoyment of life and for example, ability to drive. 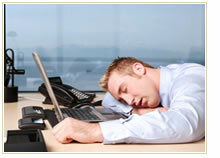 For these reasons, this clinic has emphasized the evaluation of these components as part of every sleep disorder.